After the “terrible twos” are the magic years – magic for you because your child’s listening skills and learning skills increase dramatically, and magic for them because they are among the most imaginative years your child will ever have. But like most parents, you probably wonder a little, if not even worry about your preschooler’s cognitive development. There are certain milestones your preschooler should meet, but what if he doesn’t? I’ve had five kids of my own kids and taught tons and tons of preschoolers, so I can attest to how different each child is and how each child progresses at their own rate. How they all blossom in their own time, and how some children are unique flowers with a bloom a little different from the rest. And you already know this. But what you might not know is that some parts of cognitive development in preschoolers are a little tricky. What exactly can you expect during the preschool years and when should you worry? Let me start out by saying that I am not a pediatrician. I am a teacher and a mother, and the information I share here is available upon my own research and personal experience. If for any reason, at any time, you are concerned about your preschooler’s cognitive development, make an appointment with your pediatrician. Even if you just have a hunch that something isn’t right, talk to your child’s doctor. You’ll regret having not intervened sooner if you don’t. What makes child development tricky is that every guideline is given in a range of months. They are not set in stone, and did you catch that I wrote “guideline”? It’s something to go by. So when all the experts say that your child should know all his color names by 48 months, and he is already 54 months, do you worry? Unless you are very familiar with preschooler cognitive development, you might be deeply concerned. And I’m not here to tell you that you shouldn’t be. So here is what you need to know about cognitive development milestones during the preschool years. Toddlers and young children are still pre-operational thinkers. They focus on appearances of objects rather than ideas and they have trouble comprehending multi-lateral relationships. 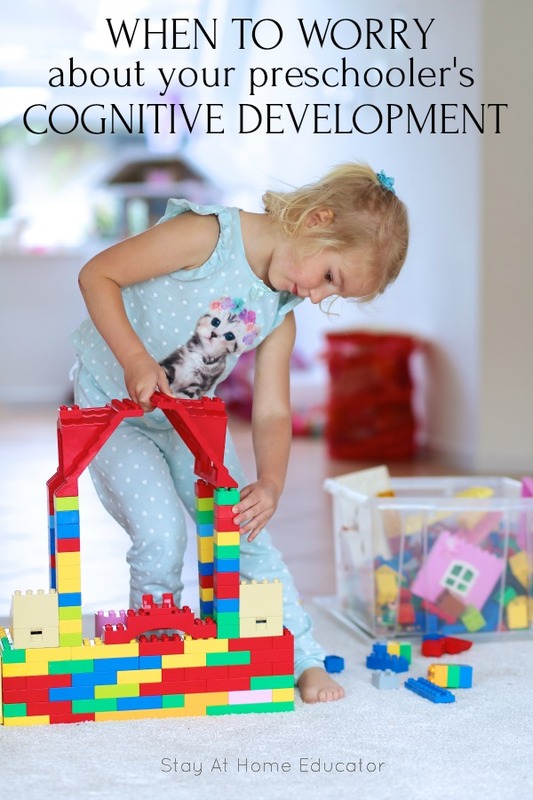 So as your preschooler’s intellect develops, they’ll become capable of symbolic thought – the ability to symbolically represent concrete objects, actions, and events. This is demonstrated by re-enacting events through dramatic play, telling stories by drawing pictures, and attempts at making up jokes. Categorization can be a struggle early on for this reason. Children have to develop symbolic thought. They won’t understand that an apple can be an apple and a fruit, or how whales and humans can both be mammals, but with valuable, constructive play, preschoolers begin to think more abstractly. Your preschooler will also probably exhibit many egocentric tendencies – they’re more aware of their own point of view than that of others. They won’t be able to understand why others feel differently than they do. If they feel incredibly happy when they get a fruit snack, they’ll be confused as to how their sibling or friend can have a fruit snack but still be sad. You can help them with this by pointing it out in appropriate situations, and by teaching them what others might feel in different circumstances. As your child’s cognitive skills continue to develop, they’ll start to think about how things work and begin asking why about everything. Asking questions may be annoying or overwhelming at times, but this is a cognitive milestone too! Although they’ll be full of questions, they won’t be ready for full explanations for many of these yet (think, “Why is the sky blue?” or “Where do babies come from?”). Do the best you can, and tell them enough to satisfy their curiosity but not enough to confuse them. When it comes to questions about why they need to do certain things, you can tell them that it’s good for them or that it’s to help keep them safe. Take even their most absurd questions seriously. It’s a sign of their growth and learning, and even if you don’t know how to answer some of their more abstract wonderings you can steer them in the right course or help them learn to find out for them self – like looking in the right book. For a concrete idea of what to expect in your preschooler’s cognitive development, here is what you can typically expect. Knowing when to be worried is difficult, but if you ever wonder, even a little, just make an appointment with your pediatrician. Milestones are set in place to be a guideline. Even if your child is meeting all those milestones and you are still worried because you have a “hunch”, act on it! Your motherly (or teacherly) instincts are valid! If you are concerned about your preschooler’s development, you should discuss it with your pediatrician. She can help you have your child tested if they agree there is reason for concern. Don’t worry yourself thinking you have to teach them too much too early, just try to put your preschooler in environments that let them explore their curiosity and be exposed to new things. Museums, zoos, aquariums, and libraries can be perfect for this, and many have free programs for preschoolers. Have confidence that you and your child can learn the answers to the many questions you’ll both have, and try to cherish this special time of your child’s life and your time as a parent or teacher. They’re called the magic years for a reason.